Place ice-cream into the refrigerator to soften. In a frying pan over medium heat, add bacon & chopped pecans to slightly brown (approx. 10 minutes). Add the maple and golden syrups, cooking for a further 10-15 minutes until syrup is slightly thickened and coats the bacon and nuts. Spread on a piece of baking paper to cool. 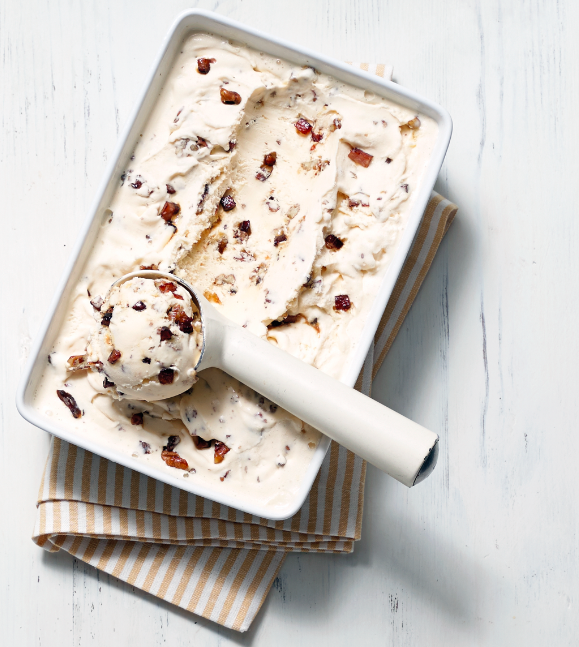 Once cooled, roughly chop the candied bacon and pecans, and add to a large mixing bowl with the softened vanilla ice-cream, mixing until well combined. Place ice-cream into a large lidded freezer container and re-freeze. Serve with an extra drizzle of maple syrup.